My best friend’s girlfriend invites me to her graduation party. I get inside information that there will be lots of drugs and excessive drinking during the party. Should I still attend the party? I know my best friend will be very disappointed if I miss this special day. Tomorrow is my final exam, and I’m completely unprepared. The grade of this exam will either break or make my opportunity to graduate as an Honors student. My friend suggests creating a “cheat sheet” to use during the exam. Do I engage in this behavior? I compete in tennis tournament with an opponent I know whose skills are sub-par. Do I play with a mindset that I’m playing with my younger sister who doesn’t know how to play or do I take every game seriously? These are several of the many similar ethical dilemmas I’ve faced in my 20’s. It seems rather easy to make the “right choice” by reading these examples. But we all know that it’s a lot harder when you are actually in these situations. Suddenly, things have become a lot more blurry. In these very moments, you are tested on what you stand for. The CV (Core Value) Syndrome is a serious lack of awareness on his/her core values that results in an inconsistent and inadequate life. The implications of not curing this disease is debilitating, resulting in a life rife with regrets and guilt. 1. Reflect Life with a Helicopter View. What values have been shared by my parents and family? What cultural values have shaped my beliefs and worldview? If you woke tomorrow morning and discovered you inherited $20 million, and had discovered you also had terminal disease with 10 years to live, what would be on your stop-doing list? What will be written on my tombstone? Write down these answers and see if there are any common threads that emerge from this process. Ask these questions to your family and best friends. They will enlighten you with fresh and objective feedback. Circle the top words that reflect your core values below. 2. Core values should be VERBS, not Nouns. Your core values are action statements, or verbs, not nouns. It is the difference between “honesty” (noun) and “Strive to always tell the truth.” (verb). Or, instead of “innovation” you might use “look at the problem from a different angle.” This makes sense because as “honesty” or “innovation” can be a nebulous concept which leaves plenty of room for different interpretations. So, thank about which one compels you to act this way? 3. Make your core values punchy. Punchy is memorable. 4. 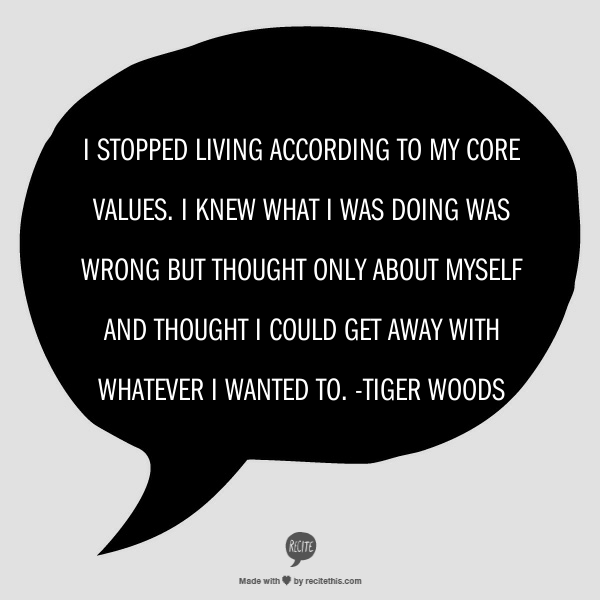 Stay away from having too many core values. Tony Hsieh, the founder and CEO of Zappos, a Great Place to Work company has built his company around their core values. He outlines 10 core values, but I would argue that while ten is a good number, people only remember 4, maybe 5. Choose the top five core values and think about how you can weave these values in the fabric of your life. Question: What are your core values?